20th July marks the departure of this legendary individual, Bruce Lee. I remembered when I was a little boy, my father came home after work and showed me a newspaper article of ‘The Green Hornet’ TV series coming to Singapore. To a 8 year-old boy who fantasised the comics world, I had absolutely no clue of what to come. On that day after dinner, Dad switched on the telly while I was wondering what to expect. He briefly told me that Bruce Lee was in the cast of Green Hornet and he was awesome. The following half an hour blew me off totally. My idol was born. So did millions of others’. The rawest form without reference (except one in Green Hornet). Simply based on memory. I have done realistic drawing, painting, and even stylised Bruce too many times, pointless doing that again. The rest of the drawings are in this raw form to illustrate his essence etched in my memory. His moves, his philosophy, his discipline, his life, his style of martial arts have inspired me all my life that he seems like a old pal now. 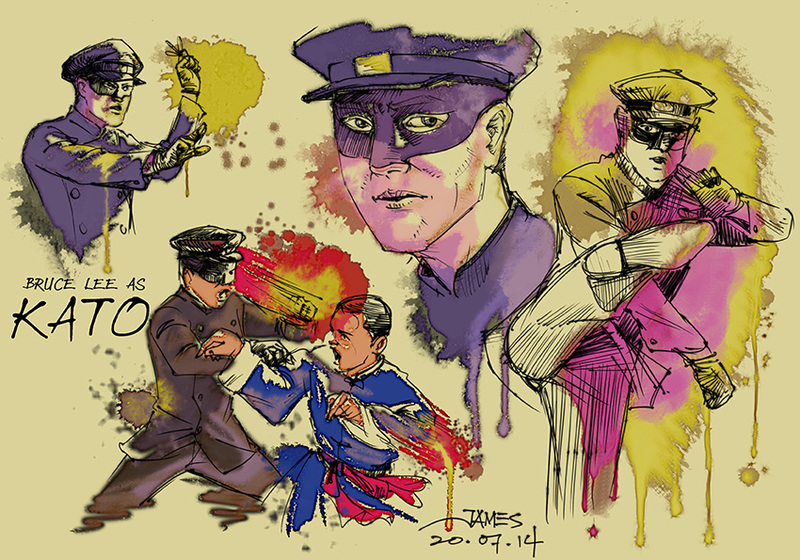 Here is the sketch of Kato in Green Hornet. His choreography action scenes was stunning! Especially the one he fought with a Chinese clan’s fighter, stunt double by Dan Inosato. 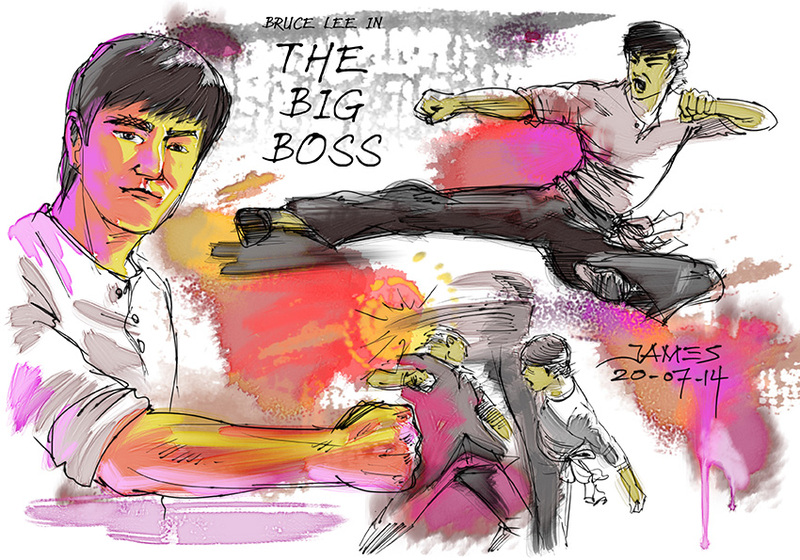 His first big gig in Hong Kong, “The Big Boss” smashed all box-office records. His moves were so fast on screen and his kicking has created a sensation. He was crowned as “Lee, Three Kicks” in Chinese is 李三脚. The flying kick was the trademark of this movie. The following movie smashed the records of his previous. 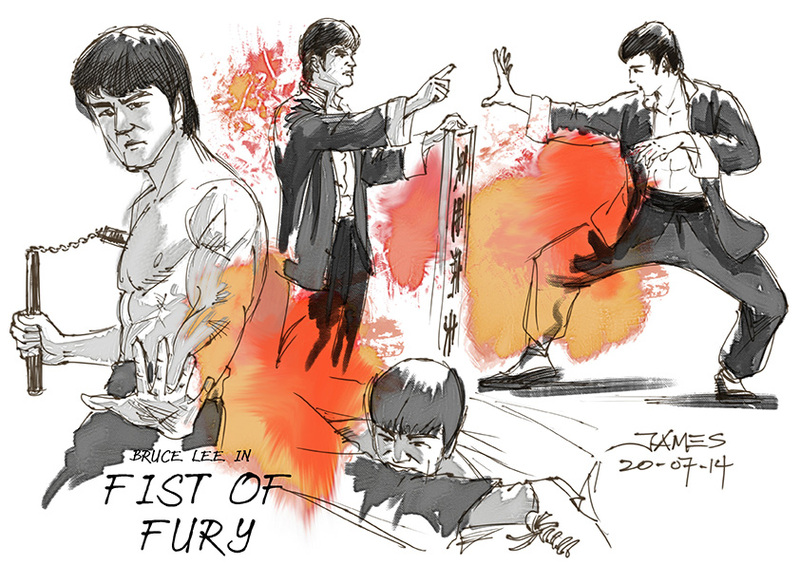 “Fist of Fury” aka “Chinese Connection”. This movie drove me to take up martial arts to protect myself and the weak ones! Dad never allowed me to do so because all martial arts clans in Singapore back then were triad-related somehow. What Bruce introduced in this movie was mind-blowing! Nunchaku and biting! Nunchaku was unheard of in those days till he displayed it with so much grace and power. Then, biting. A weapon we all have but never encouraged to use. Every part of our body is a potential weapon in times of self-defence. He made the Jap eat the calligraphy of “Sick men of Asia” which was an insult to Chinese was a classic. Love his interpretation of true fighting onscreen by biting. That’s just part 1. Part 2 is underway. Stay tuned.